Before you go and pick out every single top you plan on wearing to camp—hold on! We’ve got good news! We’ve been hard at work here at Everything Summer Camp to come up with our very own, original line of cotton camp tees. We call it our Life of Camp T-shirt Collection. Each one of these ten Life of Camp T-shirts sports cool, campy artwork or message with a fun font designed by Everything Summer Camp’s graphic designer. She wowed us with her designs so we hope you’re just as pleased with the new line. First of all, we have our Ten for Two T-shirts. These tees follow the philosophy that we liv e ten months out of the year for the two that we get to spend at summer camp. One shirt shouts “Ten For Two” and the other cleverly expresses the phrase in roman numerals. Girls, we also have a couple of adorable camp tees for you in our collection. For those of you who come from royalty, we have our very pink “It isn’t easy being a Camp Princess” T-shirt. For all the other girls shirts, we have our “Camp Like a Girl” tee. You’ll love to camp in any one of our great graphic tees. Our Happy Camper, Take a Hike, and Camp Elements T-shirts really set the mood for an adventuresome summer camping experience. The Happy Camper sets the scene of being right at home in the great outdoors while the Take a Hike T-shirt paints the picture of distant wilderness to travel. The semi-iconic Elements tee is truly transcendent. While the last three kids shirts rely heavily on the artwork, these next three have stronger messages in their words: “Keep Calm and Camp On,” “I Tree Camp,” and “Eat. Sleep. Camp. Repeat.” Each shirt still has a graphic feature and remains visually appealing to the eye. 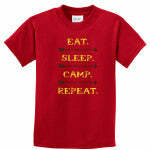 In other words, you can’t go wrong with our Life of Camp T-Shirt Collection! Check it out here at Everything Summer Camp. Till next time, Camp Fans!